Body Octane is the Most Effective Pump & Endurance product ever designed. 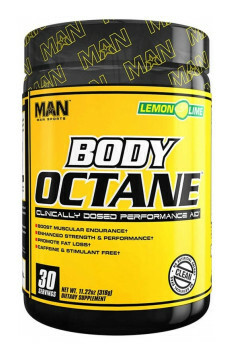 Every scoop of Body Octane contains Clinically Dosed ingredients with the highest quality, purity, & potency available. The category of No2 is full of overpromised & underdelivered products; The first thing you will notice on Body Octane’s Supplement Facts is we don’t hide trade secrets – instead we educate & show you what you are paying for. If you’re ready for the most amazing pumps & endurance of your life with Zero Stimulants, then Body Octane™ is the product you’ve been searching for. Citrulline Malate (CM) has made its way into the world of athletic performance thanks to the research and development team at MAN Sports Products Inc. This unique combination of the amino acid Citrulline and the organic salt Malate offers athletes with a new choice in improving performance and recovery. As an intermediate in the Urea Cycle, Citrulline aids in the removal of endotoxins such as lactic acid and ammonia. These endotoxins are produced through intense physical activity, protein metabolism, and catabolic states. Endotoxins damage living cells and wreak havoc on athletic performance. L-Carnitine is necessary for the production of energy from fat. Past studies suggest the effectiveness of L-Carnitine in relevance to exercise performance, cardiovascular health, weight management, and much more. Athletes have long favored L-Carnitine supplementation for its ability to increase VO2 max which is the highest volume of oxygen a person can consume during exercise. What´s more, L-Carnitine supplementation reduces lactic acid buildup and spares glycogen and as a result delays fatigue. Aspartic acid also known as aspartate is a non essential amino acid. Research suggests that aspartic acid may act as an excitatory neurotransmitter in the brain. Of further interest to bodybuilders and athletes, aspartic acid is a metabolite in the urea cycle, aiding the body in removing detrimental ammonia. It also participates in gluconeogenisis, which is the process in which the body generates glucose from non-carbohydrate sources. One serving (11.5g) immediately after waking up, the second serving 30 minutes before training. One serving (11.5g) immediately after waking up, in the second portion after 6-7h. On training days you should take 1 scoop of the product mixed in 300 ml of water or your favorite beverage, 2 times a day. The first dose should be taken immediately after waking up, the next one in the afternoon, or about 30 minutes before your workout depending on the time of training. Each serving should be separated by a minimum of 5-hour break. In non-training days, take one serving after waking and another before bedtime. MAN sports is a company offering a large selection of supplements for athletes. Among the products of this brand are creatine stacks, testosterone boosters, pre-workout supplements, supplements supporting the liver, helping to burn fat and increase the strength and endurance. Maltodextrin, Silicon Dioxide, Acesulfame Potassium, Sucralose, Natural And Artificial Flavors. Produced In A Facility That Processes Milk, Peanuts, Soy, Egg, And Shellfish.